Fantastic! Too bad Mercury was uncooperative. Not long ago, I asked what the record was for number of planets in one image. This is close to that notion -- I think it's another good challenge as to how many could at least be stitched together into one image, taken at nearly the same time from one location. I would say that "one night" would count as good. I would have allowed imagery from any location (e.g. Hubble, Cassini), but I think that viewing from the surface of Earth might be the best place anyway. It seems unlikely that this is the first time anyone has ever accomplished this, but it's the most comprehensive set I've ever seen. For all I know, from this mosaic, you've set a world record. In any case, it is very nice work, Fernando. This is some kind of awesome! Fantastic! Too bad Mercury was uncooperative. Not long ago, I asked what the record was for number of planets in one image. A couple of weeks ago I simultaneously observed Mercury, Venus, Jupiter, and Saturn. About an hour later I saw Venus, Jupiter, Saturn, and Mars. That was pretty cool. With a fisheye I could have easily imaged either group of four. That frame would also have contained Pluto, although it wouldn't have been bright enough to show up. With current practical technology (and the right date) I think the best we could hope to capture in a single image would be all the planets from Venus to Neptune. So, six. Mercury would probably be out because the sky would still be too bright for the dimmer planets to show. And Pluto would be out because no very wide angle lens system is likely to be able to record such a dim object given a reasonable exposure time. Just for fun, I like to visually spot all seven of the major planets in a single night when circumstances permit, with unaided eyes and small optics like binoculars. The current (and soon to end) evening elongation of Mercury provided many opportunities, and I ended up doing it five times. I would start with Mercury, and failure there would end the night’s effort. I also like to spot other solar system objects along the way; for example, the Moon, the minor planet/asteroid (4) Vesta, and in one case, a comet, C/2017 S3 (PANSTARRS). Although I often pick up one or more artificial satellites while I’m out looking (possibly the ISS), I don’t include these man-made objects. Perhaps arbitrarily, I’m little concerned about trying to see dim (134340) Pluto. I’ve seen it many times in the past, but I would need my 12.5-inch Newtonian to do it, and even with that scope, it’s borderline because of its inherent dimness coupled with atmospheric extinction at its current low altitude in Sagittarius. It would also require going from my suburban location to the relatively dark New Jersey Pinelands. The last time I saw all the planets in one night was July 19-20, 2018, and to make it a slightly more challenging, I decided that I had to see each object in my 85 mm spotting scope (which has no finder scope). Of course, bright objects like Venus, Jupiter, Saturn, Mars and the Moon aren’t challenging (but they had shown surprising detail in the spotter), and when you follow them on a regular basis with binoculars, Vesta, Neptune and Uranus are fairly easy to locate, as was C/2017 S3 this time. Mercury is probably the trickiest one, mainly because of the fickle nature of clouds. It can be wonderfully clear in most of the sky, but there are often streaky clouds along the respective area of the horizon anyway, so it’s pot luck finding it between clouds. Even when it’s clear along the horizon, Mercury’s varying brightness, residual twilight and/or an unfavorable angle of the ecliptic may require binoculars to find it or even see it. What is that number under Venus? Perhaps arbitrarily, I’m little concerned about trying to see dim (134340) Pluto. I’ve seen it many times in the past, but I would need my 12.5-inch Newtonian to do it, and even with that scope, it’s borderline because of its inherent dimness coupled with atmospheric extinction at its current low altitude in Sagittarius. And extinction. He's looking through a bit over two atmospheric masses. With the typical East Coast pollution and summer humidity, that could reduce the brightness by 0.7 to 1 magnitude, from an already dim 14.2. Indeed, that's what it all boils down to. A dim object, dimmed even more by light absorption and scattering by a long path through the atmosphere at low altitude, needs a dark enough background to raise contrast enough to be seen. Of course, I should have noted that "current low altitude" refers to my own observing location, which is nominally at 40°N latitude. Pluto would be well positioned for most folks in the Southern Hemisphere. I took a photo of the Moon on July 26,2018 at 12:57 AM and I think I caught a collision at about 2=11 o;clock position on the face. I did some searching for simultaneous, 8-"planet" visibility within a fisheye view. I located an example where the fainter planet was Mars, and Mercury has a good chance for being imaged. These 8-planet examples are expectedly very rare. The example below is May 5, -1972 TDT. The sun is 10° below the horizon for an observer on the equator. Mercury has an extincted magnitude of about +0.7, while Mars +2.2 with extinction. Jupiter (lower altitude than Mercury) has about -0.9 with extinction. Interestingly, Neptune might not be imaged as comes in at 9.1 mag w/extinction and Uranus is 5.6. I'd say for this example, Pluto definitely won't be imaged, Neptune is questionable, but Mercury is has a good chance. Mercury is easy. Uranus/Neptune are easy. The tradeoff would seem to be between those. I took a photo of the Moon on July 26, 2018 at 12:57 AM and I think I caught a collision at about 2=11 o;clock position on the face. <<Alpha Capricornids is a meteor shower that takes place as early as 15 July and continues until around 10 August. The meteor shower was discovered by Hungarian astronomer Miklos von Konkoly-Thege in 1871. This shower has infrequent but relatively bright meteors, with some fireballs. Peter Jenniskens and Jeremie Vaubaillon identified the parent body as asteroid 2002 EX12, which in the return of 2005 was found weakly active near perihelion. This object is now called comet 169P/NEAT. <<On 17 July 2018, an ancient lump from space thwacked into the Moon with enough energy to produce a brilliant flash of light. With another space rock seemingly in pursuit, a second flash lit up a different region of the Moon almost exactly 24 hours later. Last edited by neufer on Tue Jul 31, 2018 7:05 pm, edited 1 time in total. Great APOD! Some details though about the scope and camera would be helpful. Interesting thoughts on the practical limits. I, too, recently saw those 5 in one evening. I thank APOD for alerting me to their presence and my phone app for helping me find them. I'm counting it as the first time I've ever seen Mercury. I'm wondering if this month has been an especially good time for planet viewing, or if I'm just becoming more aware. I'm wondering if this month has been an especially good time for planet viewing, or if I'm just becoming more aware. Certainly there are cycles of better and worse planetary viewing, both in terms of position in the sky and nearness to opposition. And yes, we're in a pretty good spot right now. But such periods are far from rare. So your increased awareness is probably an important component. Thanks for pointing that out ... it's something to look forward to ! Once every billion years or so? The millennia estimate is a bit long. The 2040, 5-planet grouping separation actually is ~9.4°. Referencing the 1994 paper by De Meis and Meeus, between the years -3101 TDT and +2735 TDT, there are ten 5-planet groupings within ≤ 10°. The average then (over 5700 years) for such a grouping ≈ 570 years. 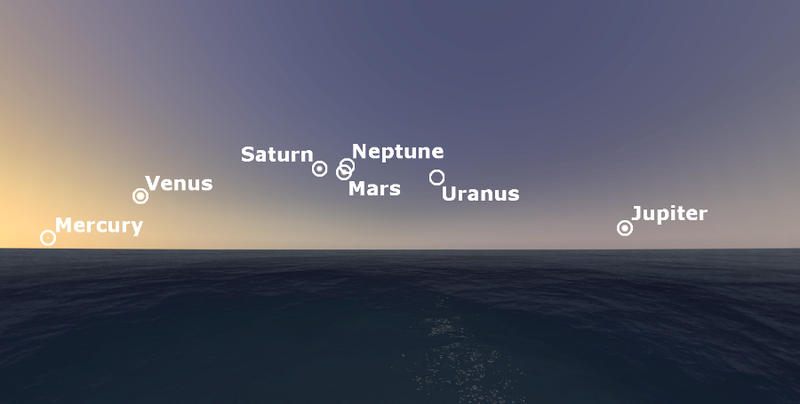 The separation for this 7-planet grouping ~165°, and happens to contain Pluto too, though not labeled. Interestingly, there's another (7+Pluto) grouping that is visible on (and about) July 30, 2478 which is tighter. The separation for this group ~133°. Regarding the 8-"planet" groupings, my limited search over the De Meis / Meeus 5700 years indicates there are at least 20 such groupings, and likely more. I don't know Dr. Baird's tool for calculating his example or why he missed the case I listed. It's clear there is a better grouping occurring 14 years earlier. The millennia estimate is a bit long. The 2040, 5-planet grouping separation actually is ~9.4°. Referencing the 1994 paper by De Meis and Meeus, between the years -3101 TDT and +2735 TDT, there are ten 5-planet groupings within ≤ 10°. The average then (over 5700 years) for such a grouping ≈ 570 years. 8213 years / ~6 close alignments ≈ a millenium. <<I've studied the alignment (as seen from the Earth) of the planets Mercury through Saturn for a period of 3,000,000 days between 4713 BC and AD 3501. The alignment width shows periodic behavior with main periods of about 10.9, 20.1, and 200 years. 5:10 am May 6, 2492. No heavy drinking on Cinco de Mayo, or I'll sleep through it. Well, your definitions do clarify things. There're many average periods depending on grouping size. However, although the statistically based "alignment width" may be a more mathematically better definition for a single, position-distribution parameter, it's certainly not visually intuitive.